Lawyer intends to sue over leak to media he says is part of 'libel campaign' against him, accusing Shin Bet of 'dictatorial' methods. 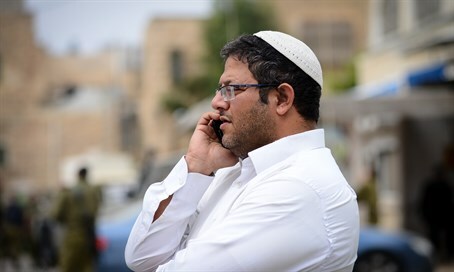 Attorney Itamar Ben-Gvir, who is representing several of the Jewish suspects being interrogated in the lethal Duma arson case, sharply criticized the Israeli Security Agency (ISA) and police on Friday morning, accusing them of trying to get him removed from the case. A video was leaked to the media on Wednesday from a wedding three weeks prior, in which people are seen dancing and singing a song about revenge while holding guns and knives in the air. One person can also be seen holding a firebomb and a picture of the Arab baby who was murdered in the Duma attack. Ben-Gvir accused the ISA of leaking the tape to try to portray him in a negative light, given that he can be seen in the video in the background taking part in the wedding. The lawyer notes that the video in fact explicitly proves that from his angle he had no way of seeing the picture of the Arab baby being held up, and that he stood at a relatively great distance from those dancing, proving he was not involved. "After we exposed the abuse of the Shabak (ISA) towards those under interrogation (in the Duma case), and after a series of disputes between myself and senior Shabak figures in TV studios in which I embarrassed them, the Shabak decided to act like a security organization in a dictatorial country, and the tendentious leaks and briefing of politicians against me have one goal - to cause me to step down from the case." The mention of politicians being turned against him comes after Jewish Home chairperson Naftali Bennett appeared on TV Thursday night, attacking "Ben-Gvirism" and "Ben-Gvirs" as being exemplary of "extremism" and "Jewish terror" in light of the wedding video, in an attempt to delegitimize and defame the lawyer in his defense of his client. "The Shabak campaign will not slow me down from acting for the rights of the 'Hilltop Youth.' I don't agree on everything with the youths and sometimes I oppose their words, but I will fight for their rights," pledged the lawyer. Ben-Gvir announced he intends to sue the Judea-Samaria district police spokesperson and the ISA for roughly 250,000 shekels (just under $65,000) for "leaking the pictures and taking things out of their context," which he argues is a breach of the law against libel. Ben-Gvir and other lawyers on the case have revealed testimony of brutal torture from their clients in the Duma case, which other legal experts say need to be investigated and taken very seriously given the large number of people testifying to the torture. The ISA issued a statement on Thursday, timed right after the wedding video was leaked, claiming it has not abused the suspects. The suspects have described brutal torture, including sleep deprivation, sexual harassment, and extreme physical abuse. One minor suspect broke down under interrogation after nearly a month and admitted to the charges, although the reported abuse raises concerns that the confession may have been false and inadmissible as evidence. Prior to the confession, officials admitted there was no evidence against the suspects. Earlier this week, one minor suspect told the court he tried to commit suicide by slashing his wrists because he could not suffer the treatment any longer, and was ready to confess to anything they asked him just to get the interrogation to stop. The suspect's arms were found to be covered in numerous scars providing further backing to his statements.